The release of the new Daniel Craig & Harrison Ford film “Cowboys and Aliens” has reminded me of my childhood. I was an avid Eagle comic reader and Dan Dare fan and possessed a Dan Dare cosmic ray gun. This was basically a torch which allowed you to change the colour of the beam from white to red or green (which looked great in the dark but not so clever in sunlight and looked like the one on the photograph except it was yellow). Problem was most of my pals were still into “cowboys and indians” and were toting cap pistols which fired from a roll and so enhanced a basic six-shooter to a 100 shot revolver. My cosmic ray gun didn’t make too much noise either so my pals tended not to play dead when I zapped them. At some point I remember getting a life-size colt 45 replica/toy gun which had realistic looking cartridges. You had to place a single cap in each cartridge so when you had fired off all six it took ages to re-load whilst everyone else was blasting off 100 cap rolls and reloading them in seconds. 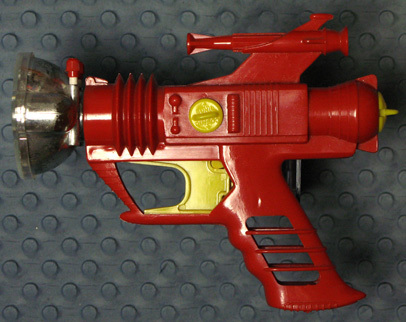 But at heart I was a spaceman – and I still love the genre – and that Dan Dare ray gun was a great toy to have. Apart from blasting aliens, and cowboys, I could also read with it under the blankets and catch up on the latest battle with the evil Mekon. See also: NASA approved sci-fi films and War of the Worlds and Alien Invasion. Categories: Happiness, Lifestyle | Tags: cowboys, Dan Dare, Eagle comic, ray guns, six shooters, spacemen | Permalink.